It's hard to believe this tiny, precious thing is now 1 year old. He sure has come a long way! He wasn't supposed to be here until June of last year, but he just couldn't wait to meet us I guess! It was really scary because we were worried about the health of my sister Jana as well as this little guy! But luckily, they both came out fine & 1 year later are doing great! He's brought so much joy to our whole family & I count down the days until I get to see him next! It's so fun to watch his growth & see all the different changes he's making! Yesterday was his birthday party & it was so much fun! My favorite part was when it was time for cake! 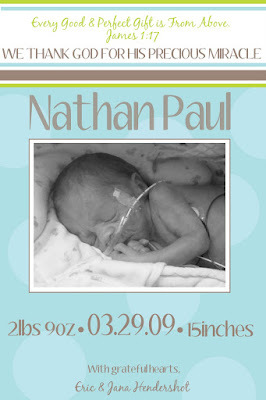 Nathan is still having trouble eating solid foods (he just doesn't like them for some reason!) so he didn't eat much of the cake, but boy did he play in it! He had it all over him! It was so cute! He did start to eat the icing and cake that was on his hands & I'm not sure if he ever made up his mind whether or not he liked it! Either way, it was so fun to watch! I just love that little boy so much! Being an aunt is just so much fun! Here is one of his Easter/1 year pictures!